I’ve been pondering how best to plot my second novel for a while now. Not as in what the story should be but as in how, physically, to write down what should happen. Some authors use index cards. Some use computer programs like Scrivener. Some, of course, don’t write anything like that down at all: those authors are known in the trade as “pantsers”, as in “fly by the seat of”. That was how I wrote my first draft, which consisted mainly of one plot line: Louisa, who’s an evangelical Christian, falls for Aaron, who isn’t, and whom she consequently is not advised to date. There were occasional references to the primary campaign they were working on – mainly to move them from place to place and give them temptations like beds in hotel rooms – but that was it. But I called it Primary Season for a reason. (Apologies for the terrible and unintentional rhyme there.) I didn’t want to write just another doomed love story, fun as those are. I wanted to explore what it might be like to work on a primary campaign in the – gasp! – Democratic Party as an evangelical Christian, and I wanted to do that from several angles. I also wanted to write a book that the kind of women who miss The West Wing might enjoy. This means that I need more than one plot line. (Every novel does, in any case.) I need to weave in various scandals and debates and ad campaigns and press leaks. And I am not (yet?) skilled enough to be able to hold all those things in my head and mesh them together without the use of coloured Post-It notes. Not only are there the plot lines to bear in mind, there’s also the timeline. Aaron and Louisa’s non-relationship needs to move along at a realistic pace, and needs to somehow fit into the schedule of primaries and caucuses and town hall meetings. It all becomes a delicate balancing act. I also want some kind of system that shows me clearly which scenes I have already written, and which scenes I still need to write. 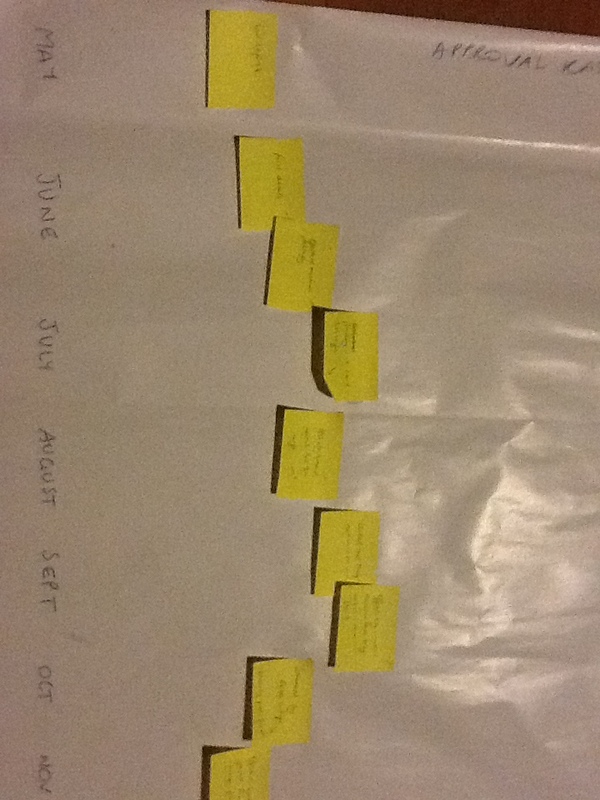 That works quite well as a general outline, and I may still use it, to show the main plot points and the fluctuations in the Candidate’s numbers as well as in Aaron and Louisa’s non-relationship (which would be in a different colour, just above the yellow Post-Its.). But it doesn’t help me with the kind of detailed outline that I need – scene by scene – and it also doesn’t provide a way for me to easily see which scenes still need to be written. 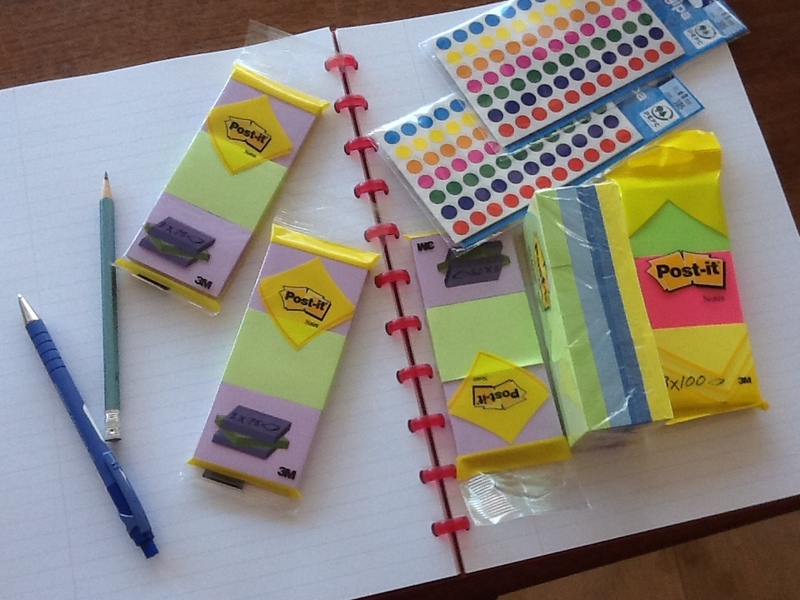 Cue a Google search of “planning my novel with Post-Its”. I discovered Julie Cohen’s blog, and her solution seemed to work well for me. Best of all, she was doing it with Post-Its and paper. But she didn’t have a timeline that I could see – and she didn’t have the issue of needing to separate finished and unfinished scenes. Then – possibly in a midnight epiphany – I remembered this pin I’d liked on Pinterest. (The idea, and the picture, comes from jenhewett.blogspot.com.) If I adapted the model a little, I could use a left hand page for scenes written, and the facing right hand page for scenes yet to be done. 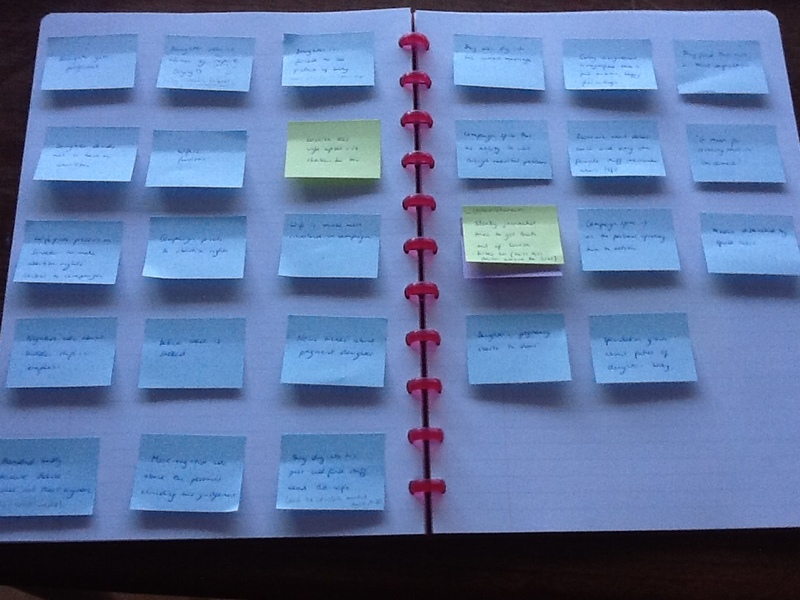 Once I’ve written a scene, I move the corresponding Post-It from the right hand side to the left hand side. And as for the timeline, each set of 2 facing pages of my Atoma notebook can be used per month of the campaign. Why an Atoma notebook, I hear you ask? Because you can move the pages around. So if it turns out that I have more scenes in August than will fit on the two pages, then hey presto, I just add a page to August (without having to calculate how many pages I think I might need and then panic when the system threatens to break down). 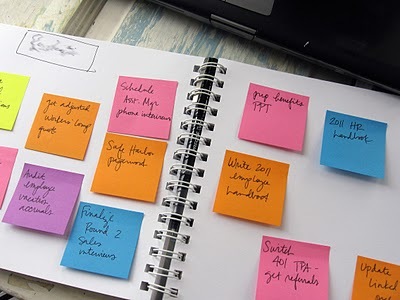 Plotting needs to be flexible – which is why I like Post-Its; they’re so easy to move. I had fun tonight. Step 1 is to take each plot strand and break it down into scenes (and believe it or not, this whole process helps me think up new scenes, too, since it helps me to see a logical sequence of events). So, below, we have one of the storylines that I will be threading through the novel. Mostly, it’s a campaign-based storyline – hence the blue (for Democrat! ), but there’s also a bit of Aaron-and-Louisa (in purple), and Louisa-on-the-campaign (in light green). And where there are two Post-Its (thank you, Julie Cohen), it’s to show that two of the plot strands are being developed at once in a scene. When I’ve done this for all the various strands (assuming Viking Direct Belgium get their act together and finally deliver the next lot of Post-It notes, since I need more colours), the fun (and the headaches) will really begin: threading them together and pacing the various stories so they fill the months required. If you’re really lucky, I’ll write another post, complete with a photo or six to show off my efforts. Oh, and then, all I need to do is write the thing. It makes me happy when people ask me what’s happening with my book. It also bemuses me a little, since I often assume that by now my entire entourage know that if I had any kind of news, I would be plastering it all over the internet. But in any case, if you missed the excitement in my tweets and Facebook profile a few weeks back, here are the three main things happening at the moment. 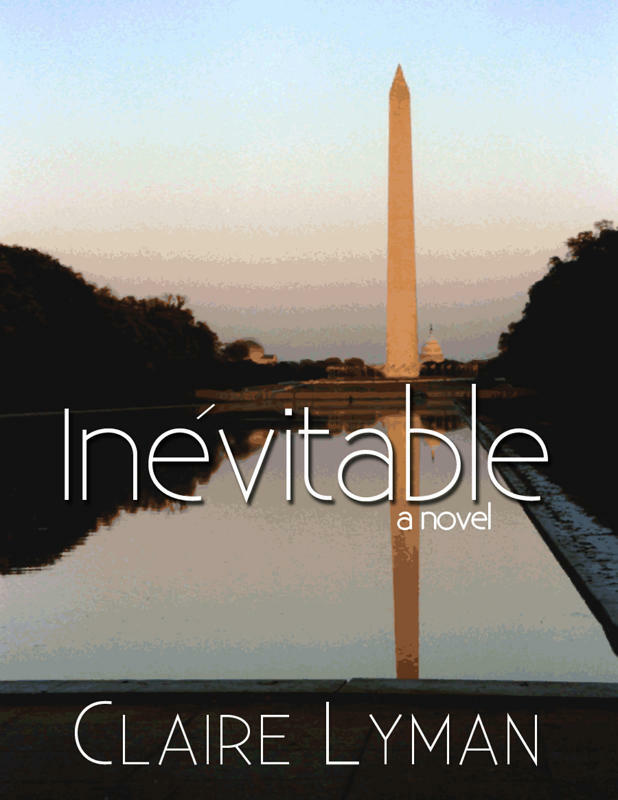 – Inevitable is now at number 4 on Authonomy. This, theoretically at least, means that it will make the top five on 1st May, after a year on the site and many more hours faffing around on it than I care to count. Every month, the five at the top of the list get whisked away to the desk of a HarperCollins editor (at least, we all hope it’s an editor and not a junior editorial assistant in her first week of work experience), and several weeks or sometimes months later an extensive comment is received. We all hope it’ll be accompanied by the instant offer of a publishing contract, but it hardly ever is. – Meanwhile, I’ve also paid to have a couple of professional reviews done. The first from the London Writers’ Club, which is run by two literary agents who offer to report back on your first 50 pages, plus – crucially – the query letter and synopsis that have, in my case, failed to enthuse anyone in the publishing world so far. That one was kind of devastating – mainly because I felt as if they hadn’t “got” my book, but had tried to pigeonhole it into something it isn’t, and doesn’t want to be – but it did contain nuggets of helpfulness. The second was much more useful – it’s a wonderful scheme for new writers run by the Romantic Novelists’ Association, in which you get an in-depth critique of the whole novel from an experienced writer. I got a detailed six-page report which was encouraging but not pandering and gave me many useful pointers. – The most exciting thing to happen so far has been that through a connection with an author whose work I love, I got to send Inevitable to an editor at a major New York publishing house. (You don’t usually get to do that except through an agent, and I haven’t managed to snag one of those yet.) I haven’t heard anything back, and in a way I’m not surprised – but the set of circumstances which led to this were fairytale-like and inspired the plot for my third novel, so that’s good enough for me. Well, almost. So now I have a choice. Either way, I am going to work on it some more, but then what? Self-publishing? I was dead against this a year ago, but am coming round to the idea. Most importantly, it gets your work out there rather than keeping it sitting in a draw. It’s so cheap, so easy, and people I know are making decent money at it. But should that be the main consideration? No, it shouldn’t. In a way, I wish I’d never looked into the world of publishing. I deliberately avoided all of that in my first 18 months of serious writing because I wanted to write for the pleasure of writing. And that childlike innocence is not something I’ll ever be able to recover. Since I’m hopefully about to spend two years working on my writing – and, crucially, getting coaching – I am thinking I should probably hold off in any case. If, by the time I have my MFA from American University (sorry, I just have to keep saying that!) and have reworkedInevitable and met several agents, there is still no interest, then I probably will take the plunge. Or, by then, I’ll be wise enough to know not to bother. Either way, though,Inevitable will always have a place in my heart and I think I’ll always be proud of it. Meanwhile, I’m working on my second novel. Primary Season tells the story of an evangelical Christian named Louisa Perry who works in Democratic politics. It’s not always easy, let me tell you, and it’s not made any easier by her crush on the maddeningly attractive Aaron Rosenberg. A lighter read? Welllll, maybe. Hopefully not a predictable one, though. Every once in a while, a book casts a spell on me. In 2010, it was The Song Is You, and you know that, because I still talk about it, I still recommend it, I still insist that it deserves to be better known. In 2012 – is it too soon to say? – it will be Come To The Edge. The elegance of the writing, the beauty of the story: “haunting” is how I have seen it described, and that was the word I would have used too. I don’t remember the last time a book kept me awake and away from even Twitter for two hours at a stretch. Christina reminds me – perhaps inevitably – of Kate, the heroine in my first novel. “I did not know,” she says, “how long it took to get over such a love, and that even when you did, when you loved again, you would always carry a sliver of it in your stitched-together heart”. Come To The Edge is a book full of emotion, not in a trite, schmaltzy way, but the way it’s supposed to be, the way that people tell you to do it at writing workshops: show, don’t tell. Christina takes us by the hand and she shows us what it means to be her, what it means to be John, what it means to be with John, what it means to no longer be with him. She makes me want to travel to places in America that I’ve never heard of. Her writing is quite simply superb, her vocabulary varied – it sounds like a small thing, but it’s one of the small things that makes a book worth staying up until two a.m. to finish: when was the last time you came across the word “epiphyte”? On almost every page there was a turn of phrase I wish I could have written. So, her writing: study it, aspiring authors. Particularly aspiring memoirists. Study it for colour and depth and how to bring the past back to life and how to convey the magic of childhood and of love. Study it to learn description and how to draw out character. Study it for the poetry of the language. If you follow this blog, chances are you’ll know what led me to this book: it wasn’t the main story. It was a subplot about a man Christina dated for three years. You know the one. But I’m glad my endless fascination with him led me there. I’m glad that, after telling myself that it was a ridiculous reason to buy an overpriced hardback book and that it was probably really badly written anyway, I travelled to America when Amazon had it on special offer and I read some reviews that praised the prose. I thought, you know what, beautifully written tragic love stories set against a political backdrop are my thing. They’re what I write. I should read it for research. But the stories I write are made up. This one, this heartbreaking one, is real. It can’t have been easy to reach into the past for these memories, to draw them out and have the emotions rush back. 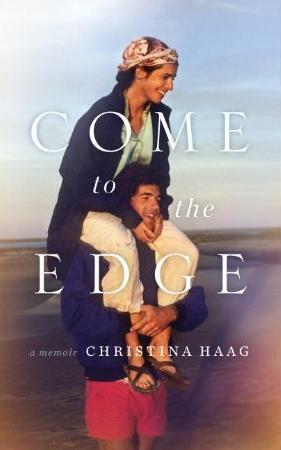 But if I ever get to meet Christina Haag, I will thank her, because this is a story that needed to be told, and that it’s told so deftly means that it will reach the kind of people who don’t read celebrity biography. Literary snobs, if you will. People like me. And then I will ask her to please keep writing. I’ll tell her that I go to a Monday Night Writers’ Group too. I don’t know why I’ll tell her that. Probably because I babble when I meet people I admire. Nobody prepares you for life after the novel. Nobody prepares you for the emptiness. I have an idea for my next one. That’s all it is for now: a gem of an idea. But that’s all Inevitable was until I sat down with exercises from the Five Minute Writer and my characters leapt to life. I could do it again. I could sit down and flesh them out. I’m not ready, partly, because I’m scared. What if the next one isn’t as good? What if the voice I found for Kate only works for Kate, and I can’t find a different one which is also still me? What if all my characters are carbon copies of Kate, with her love of books and coffee and grammar and politics? What if I don’t know enough about the themes I want to explore, and I make a fool of myself, or worse, offend people? But those aren’t the main reasons. The main reason is that I can’t let go of my first novel. And that is partly a good thing. Although I have proclaimed it finished, posted it on Authonomy, drank numerous glasses of pinot grigio blush in its honour, I know it is not, actually, finished. There is tweaking to be done. There may be scenes to rewrite, or – oh, the pain – to delete. And how can I immerse myself in that world again to make those changes if part of me has moved on to another one already? I may be walking down the street or listening to a political podcast or reading a book, and a new idea may present itself that would work well as a sub-plot or an extra scene. Granted, this hasn’t happened in a while, which was one of the signs to me that it was, in fact, finished. But I don’t know how to have an idea and not make it part of Inevitable. I miss looking forward to a Saturday which starts with coffee and a writing prompt and ends in new pages or better sentences. I miss the process, and I miss the writer’s high. I miss hanging out with my characters, and I am afraid of being unfaithful to them if – as I must – I fall in love with a new cast. But how to move on? And how to keep writing? And what to keep writing, when I’m not ready to let go of my first novel? Nobody prepares you for this. I really wish they would. It’s National Grammar Day in the US, and I couldn’t pass up the opportunity for a related blogpost (and a plea to my fellow countrymen to institute such a thing on our shores). I’ve noticed a few of my Facebook friends have issues with using apostrophe’s* and so in a spirit of helpfulness (and not at all because a misplaced punctuation mark reminds me of the sound of nails on blackboard) I thought I would write a no-nonsense guide to using them. I’m still trying to decide if I should tag the culprits in a you-need-to-read-this kind of way. What is the etiquette? Has anyone found a way of gently, lovingly yet a little forcefully pointing out that the person in question really does need to have a quick read of this helpful little blogpost? I’m not going to go into all the complexities. There are three main points you need to remember. 1) APOSTROPHES ARE USED WHERE A LETTER IS MISSING. For example, he can’t, instead of he cannot. I don’t, instead of I do not. 2) APOSTROPHES ARE USED TO SHOW POSSESSION. Sometimes, it’s not massively clear that there is a possession, for example in two weeks’ notice or last month’s meeting. In cases like this, substitute one: one week notice doesn’t sound right; even with one there is an s; so the s is not a plural. That means you put an apostrophe there. 3) APOSTROPHES ARE NEVER, EVER USED TO PLURALISE ANYTHING. When something ends in a vowel, like potato, you need to add an e: potatoes. If a word ends in a y, like country, you have to change the spelling thus: countries. But you knew that already, didn’t you? All the books on writing that I’ve read lately have said so, and my experience would certainly concur: if you really want to be a writer, it takes time. You will have to sacrifice hobbies. Other things may have to fall by the wayside. It’s also been said many times that to be an expert at anything takes 10,000 hours: that’s 10,000 hours spent not doing something else. How does that work, when you believe your primary purpose on earth is to build the Church? If writing a novel really *did* take a year, or a few months, then maybe, maybe you could take a few months out of the teams you’re serving on: after all, the Earth is the Lord’s, and everything in it, and having quality fiction written by Christians is an important aspect of our being salt and light. But it doesn’t take a year. It takes, like, forever, and during that forever, you eat, sleep and breathe it. And are you not making an idol of your writing if you put it first? Or, and yes, I know you’re all getting tired of the pregnancy analogy, but is it a “season of life” thing – stepping back for several years to give yourself to something worthwhile? Great. (Except that it’s quite possibly not just a “season”. You’re probably a gonner forever.) But everyone understands that babies are important and time-consuming and take over your life. I think most non-writers don’t really understand that novels also do that. That they almost have to, if they’re going to be any good. Does it matter what others think, whether they understand? No, of course it doesn’t – if you have rock-solid self-confidence and a mandate written across the sky. For the rest of us, it matters hugely. If you have a baby, everyone understands that you are busy, not sleeping much, and that any conversation with you is going to involve the kind of minutiae that others, in particular non-parents, are not necessarily enthralled by. But can you really say, well, I’m taking time out from such-and-such for a few months while I get my novel written? Or, worse, I’m really sorry, I don’t have much spare time to meet up, and I probably won’t for the next few months, since whenever I have a chunk of uninterrupted time I sit down and write, and that’s what I’m prioritising? I mean, it sounds so cold, so callous. Not to mention a little dysfunctional. All the books give you permission to do that. More than permission – they seem to require it of you. But the problem is, writing is a less common occupation than having babies, so most people probably don’t get it. So you risk offending people. You risk people thinking you don’t care about their friendship. You risk people misunderstanding you, or judging you, or thinking that building Church is not supremely important to you. You risk worrying that yourself. If you’ve met me in the last couple of years, you could be forgiven for thinking that I’m some kind of introverted hermit, uninterested in friendships, and obsessed with spending as much time at home with my West Wing DVDs as possible. But ask people who’ve lived with me: believe it or not, before I remembered I was a writer, I would panic at the thought of an evening in by myself. I would hang around at Church till the very last person had gone. I would meet up with as many people as possible for lunch and coffee and dinner. It’s just that my priorities are different for now. I don’t know how that works long-term. I keep hoping for the rich husband or the lottery win that will enable me to quit my job, so I have time to write and be sociable and serve on all the teams I can shake a stick at and engage meaningfully wtih the country I live in and help my friend check his thesis for grammar errors, but short of that something has to give. And that something is not going to be, cannot be, my writing, not because it’s an idol, but because it’s what I was made for. To paraphrase Eric Liddle, God made me to love words, and I feel His pleasure when I write. T’as des enfants? Des cheveux gris? Tu as connu beaucoup de filles? Tu deviens quoi? Beaucoup changé? Et tu fais quoi comme métier? Tu penses a moi… c’est évident. Ne rien attendre de nous deux? Si on n’avait rien à se dire? Ou bien au cas où… tout risquer? Alors, voilà. Je l’ai, mon nouvel ordinateur, qui « parle » français. Plus d’excuse. Vous devriez pouvoir revenir tous les jours voir mon blog et, en principe, y trouver quelque chose de nouveau, d’original ou au moins de bien écrit. Pourtant… reste le syndrome de la page blanche et de la petite panique quand on se retrouve seul avec le stylo métaphorique qu’est le clavier. J’ai les moyens, maintenant, non pas financièrement parlant – si seulement je pouvais me permettre de vivre de ma plume ! Un jour, peut-être, mais ce n’est pas pour demain – mais du moins, les matériaux (et la maitrise du français) qu’il me faut pour écrire plus régulièrement. Et pourtant… l’inspiration vient-elle plus facilement lorsqu’il est plus aisé d’écrire ? Il me semble que non. Sinon, comment expliquer le phénomène connus par tous les écrivains, ou les idées se bousculent au moment de se coucher, quand la lumière est éteinte et le carnet hors de portée ? Prologue à mon prochain roman..
“Elle s’appelle Keziah” , me sourit maman, en me tendant ma petite soeur flambant neuve. Flambant, c’était d’ailleurs le cas de le dire – elle était toute rouge, même si, côté neuve, elle n’en avait pas tout à fait l’air: fripée, comme une vieille dame. “Keziah” , répétai-je, en la prenant dans mes bras, mes yeux débordant d’admiration pour maman et d’émerveillement, d’affection, pour cette minuscule créature, à qui je promis en silence de toujours l’aimer et de m’avérer la meilleure grande soeur du monde. Le Seigneur combla Job de ses bénédictions, plus encore qu’il ne l’avait fait auparavant. … Il eut aussi sept fils et trois filles. Il nomma la première Yemima, la seconde Keziah* et la troisième Quéren-Happouk. Dans tout le pays, on ne trouvait pas de femmes aussi belles que les filles de Job. Leur père leur réserva une part d’héritage au même titre qu’à leurs frères. C’est vrai, elle ne s’en était quand même pas trop mal tirée. Je la voyais mal écrire “Quéren-Happouk van der Kindere” dans ses cahiers de première primaire, alors qu’une petite veinarde aurait le temps de gribouiller trois fois “Claire Martin” ou “Lydie Icks”. Maman se contenta de me sourire. Je connaissais la réponse plus que suffisamment. Rien de spécial… d’où le deuxième prénom duquel on m’avait affublée, Désirée, que je n’étais pas sur d’aimer en lui-même, mais qui exprimait si bien les sentiments de mes parents lors de mon arrivée qu’il m’était véritablement précieux. * Keziah est l’orthographe anglaise de Quessia.